On Sunday, I had an audition, a rehearsal, and a performance. On Monday night, I participated in a workshop where I got to play the sweet, adventurous ingenue. Tuesday and Wednesday, I attended seminars at Actors Connection. Tonight, I’m going to see Lear at The Shakespeare Forum. It has been a full week, and I wouldn’t trade it for anything. Sunday was a very busy day, and by far the fullest. But that day gave me the kick-start I needed to keep my energy going the rest of the week. I started by auditioning for a show and a role that has been on my bucket list for YEARS. I’m still waiting to hear back about casting, but I know that I gave a great audition, and regardless of what happens, I’m happy with my work, which is all anyone can expect, really. After my audition, I went home for a little while, then headed right out again for a short rehearsal before our All-Female Staged Reading performance of Rosencrantz & Guildenstern Are Dead. Rosencrantz & Guildenstern Are Dead Cast. Love you, ladies! This cast was a BLAST to work with, and the show went really well! The laughter from the audience, and the pure joy I felt at performing such a fun character with such funny women… I wish more of you could have been there. 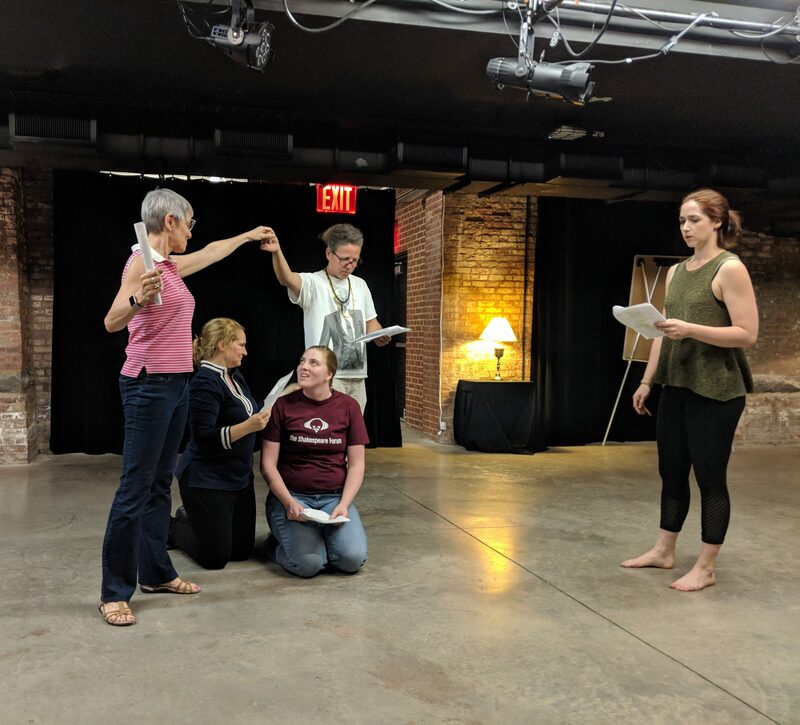 We were a last minute replacement for a slot in The Shakespeare Forum’s summer festival, and I was the only one in the group who hadn’t done the staged reading before. We only had 4, maybe 5 rehearsals, and our original director had to bow out due to scheduling conflicts. So there were A LOT of factors contributing that could have meant a poor performance. 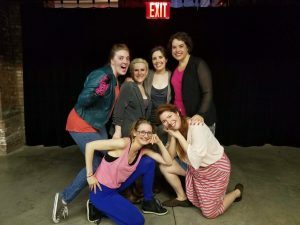 But we six, fierce women pulled it together, had a lot of fun rehearsing and playing off one another, supported each other, and gave a GREAT performance. Monday night, I had the privilege of participating in a workshop given by Turn to Flesh Productions called “True as You Can Be,” which focused on allowing actors to play roles that are against their “type,” and more closely align with who they really perceive themselves to be. As a tall, not particularly fit young woman, I often have been cast (especially in high school and college) in maternal/authority figure roles. And in truth, I don’t mind that, except that I’m only 28, and I look younger than that, so I won’t be considered for those types of roles again for another 10 years or so. 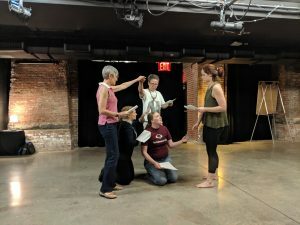 In this workshop, we each shared what we’re usually cast or typed as, and what we feel is more true to what we’re able to play, even if we don’t necessarily look like that type. I had the opportunity to play Persephone in a New Verse play beautifully written by Emily C.A. Snyder, called Persephone Rises. In the scene, Persephone has just been born, and her mother, Demeter, along with Artemis and Athena, are about to crown her as Queen of the Virgin Counsel, when Cupid arrives, and sweeps Persephone off her feet, and causes her to start questioning whether she really wants what Demeter wants for her. It was so wonderful to be able to play a part that is so different from what I’ve usually been cast as. And getting to witness other actors play their truth was truly inspiring. On Tuesday and Wednesday, I was able to attend seminars at Actors Connection, and though I don’t think either of the agents I met is ready to sign me, I did learn a few bits of wisdom from each of them. Namely, that if you are continually working on honing your craft: workshops, classes, auditions, etc., THAT’S what makes you a good actor. Tonight, I will attend Lear at The Shakespeare Forum, and I’m so excited to see these actors’ hard work. I have heard great things about it, and I know that I will leave the theatre tonight inspired, and ready to keep working!